2018 Motor Trend Truck of the Year. The 2015-2019, thirteenth generation, F-150 has been built from years of testing and engineering to provide the greatest overall performance from any truck on the market. Whether you are looking to light up your truck bed for use on the jobsite, or you need that special edge at a car show with custom LED headlights, Diode Dynamics is your source for LED lighting upgrades. At Diode Dynamics, we focus on LED upgrades for headlight bulbs, fog lights, cargo lights, and of course custom accent lighting, including RGBW boards. LEDs are a great way to increase nighttime visibility, whether it's a subtle LED bulb upgrade or a complete headlight retrofit. 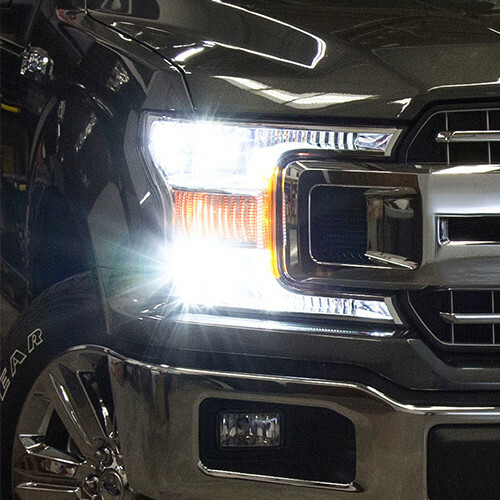 Sign up to our newsletter to stay up-to-date on the latest LED lighting upgrades for your 2015-2019 Ford F150!